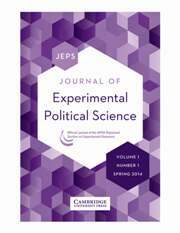 The Journal of Experimental Political Science (JEPS) features research – be it theoretical, empirical, methodological, or some combination thereof – that utilizes experimental methods or experimental reasoning based on naturally occurring data. We define experimental methods broadly: research featuring random (or quasi-random) assignment of subjects to different treatments in an effort to isolate causal relationships between variables of interest. JEPS embraces all of the different types of experiments carried out as part of political science research, including survey experiments, laboratory experiments, field experiments, lab experiments in the field, natural and neurological experiments. JEPS publishes primarily concise articles of approximately 2500 words that immediately address the subject of the research. Submissions of manuscripts longer than this limit (up to 35 pages) will be considered during the initial round of submission with the understanding that the paper will be shortened within the word constraints during the review process. To be clear, we prefer submissions of approximately 2500 words, but we do not want to deter authors from submitting papers that are currently of a more standard length. However, if the paper is accepted for publication or if the authors are invited to revise the paper for reconsideration, it will need to be shortened at that point to meet the Journal’s word constraints. We realize that this represents a new format for publication for most of our authors. However, we are – appropriately enough – experimenting with this type of shorter publication in an effort to increase the reach of your research, in the hope that these shorter, more immediately to the point types of articles will lead to more people reading them. Please note that this decision to publish shorter articles is a mandate from the APSA Section on Experimental Research, the publishers of the journal, and thus beyond the purview of the editors. We also publish more lengthy articles in appropriate cases, as in the following examples: when a new experimental method or approach is being introduced and discussed, when a meta-analysis of existing experimental research is provided, or when new theoretical results are being evaluated through experimentation and the theoretical results are previously unpublished. We will not review papers that are currently under consideration for publication elsewhere, whose contents have been substantially published before, or that exceed 35 pages formatted in accordance with the instructions below without prior permission from the editors. Such requests should be sent to jeps@nyu.edu. Papers that report on original experiments are recommended to follow the Reporting Standards for Experimental Research (Lab, Field, and Survey) devised by the Experimental Standards Committee of the American Political Science Association’s Organized Section on Experimental Research, which can be found here (url link to standards document). Some of the detail in meeting these standards may be uploaded as part of the supplementary materials described below which does not count against the word or page limits. If researchers have questions about the standards, they should be sent to jeps@nyu.edu. All submissions to JEPS should be made online through Editorial Manager at www.editorialmanager.com/jeps. As part of the submission process, authors will be given the opportunity to suggest possible reviewers, designate keywords, and identify appropriate classifications of the manuscript. Authors will be required to provide an abstract in the submission process. The abstract should be a single paragraph of 150 words or less that succinctly describes the research question addressed, the analytical approach and the major findings of the manuscript. References and citations to other work should not be included in the abstract or any identifying information. This includes acknowledgments of funding, student assistance, or other institutional or personal identifications that could identify the author(s). The abstract is not included in the word or page limit. Title Page: The author must attach a separate file containing a title page, with one author’s full contact information (including email address, telephone number, institutional affiliation, and his or her institutional position (graduate student, postdoctoral fellow, Assistant Professor, etc.). The title page must all contain the names, institutional affiliations, and institutional positions of all co-authors. The title page should also include Twitter Handles for all authors on Twitter, which will be used for publicity if the paper is accepted for publication. Finally, authors should include the word count of the paper on the title page. The title page is not included in the 35 page limit. Manuscript: Manuscripts submitted for review should format all the text and appendix materials double-spaced in a standard 12-point type font. Footnotes and bibliographic citations may be single-spaced using the same font size as that used in the body of manuscript. Tables and figures may also be single-spaced and we strongly prefer that they be included in the manuscript where they are discussed. As noted above, manuscripts of approximately 2500 words are preferred, although manuscripts up to 35 pages will be accepted for review with the understanding that they will be substantially shortened at the revision stage. Manuscripts more than 35 pages will not be reviewed unless the author has received prior permission from the editors. Papers accepted for publication must be prepared by the author in accordance with more detailed requirements for headings, bibliographic citations, tables, figures, and related matters. Instructions regarding these requirements are made available at the time papers are accepted. All identifying information must be removed from the submitted manuscript file. This includes acknowledgments of funding, research assistance, or other institutional or personal identifications that could identify the author(s). Review History of the Manuscript: Authors may submit reviews and communications from editors at journals that have previously reviewed the manuscript but have declined to publish the manuscript. Authors may also submit their responses to these reviews as well as a discussion of changes made to the manuscript in response to such reviews. If authors choose to submit such materials, the materials must be complete and report the full reviewing history of the manuscript. These materials will not be included in the 35 page limit and will be reviewed by the Editors and Associate Editors only; they will not be sent to reviewers. Materials Required Before Publication: Before publication, authors are also required to submit the following additional files, which can also be uploaded during the submission process as well, but are not required unless a paper has been provisionally accepted for publication. These materials will not be included in the 35 page limit and will be reviewed by the Editors and Associate Editors only; they will not be sent to reviewers. Failure to provide these additional files before publication can mean a reversal of an acceptance decision. Institutional or Human Subjects Review Board Approval: Before publication, authors of papers using data from human subjects will be required to either submit Institutional or Human Subjects Review Board Approval for their study or, if not possible, an explanation of how they dealt with possible ethical issues in the experimental work. These materials will not be included in the 35 page limit and will be reviewed by the Editors and Associate Editors only; they will not be sent to reviewers. Of course, if there are particular ethical issues or other issues, which required or should have required special consideration because they were beyond minimal risk to the subjects or for other reasons, it will be expected that the authors address these issues in the manuscript itself. i. Sources of financial support for the research. If none, that fact should be stated. ii. Each author of a submitted article should identify each interested party from whom he or she has received significant financial support, summing to at least $10,000 in the past three years, in the form of consultant fees, retainers, grants, and the like. The disclosure requirement also includes in-kind support, such as providing access to data. If the support in question comes with a non-disclosure obligation, that fact should be stated, along with as much information as the obligation permits. If there are no such sources of funds, that fact should be stated explicitly. An “interested” party is any individual, group, or organization that has a financial, ideological, or political stake related to the article. iii. 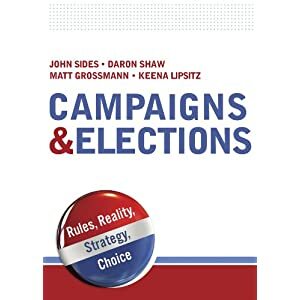 Each author should disclose any paid or unpaid positions as officer, director, or board member of relevant non-profit organizations or profit-making entities. A “relevant” organization is one whose policy positions, goals, or financial interests relate to the article. iv. The disclosures required above apply to any close relative or partner of any author. v. Each author must disclose if another party had the right to review the paper prior to its circulation. Data and Relevant Replication Information: Before publication, authors of empirical papers (either using experimental or observational data) will be required to submit additional files for replication purposes. For experiments these files should include original experimental instructions or other experimental instruments used in the experiments such as surveys, videos, computer programs, etc., and the raw data from the experiment. For empirical papers, both using experimental or observational data, the final data set(s) and programs used to run the final models, plus a description of how previous intermediate data sets and programs were used to create the final data set(s) must be provided. The data files and programs can be provided in any format using any statistical package or software. Authors must provide a Readme PDF file listing all included files and documenting the purpose and format of each file provided, as well as instructing a user on how replication can be conducted. If a request for an exemption based on proprietary data is made, authors should inform the editors if the data can be accessed or obtained in some other way by independent researchers for purposes of replication. Authors are also asked to provide information on how the proprietary data can be obtained by others in their Readme PDF file. A copy of the programs used to create the final results is still required. Questions regarding the manuscript submission process should be sent to jeps@nyu.edu. Authors may check on the status of their manuscript by accessing their author page in Editorial Manager. Also, about the types of accepted files, where it reads “MS work”, I think you mean “MS word”, right? I’m loving the idea of mandating a much shorter word count, and I would love to see other journals follow this model. Most analytical articles I see in top journals could safely relegate most of their methodological discussion to an online appendix, for example.